DÁFNI'S signature Greek Drizzling Oils combine our finest Extra Virgin Olive Oil, and Wild Greek Oregano that is handpicked from the ­mountainsides of Lakonía. In Greece, it is custom to top garden salads with olive oil, oregano, and either fresh lemon juice or a vinegar base. This authentic Greek recipe is simple, healthy, and delightful. Our Wild Greek Oregano gives our Drizzling Oils a distinct, robust flavor. There are three delectable flavors to choose from: Lemon, Red Wine Vinegar, and Balsamic with fresh garlic. They will add a special touch to dips, salads, marinades, pasta, sandwiches, veggies, potatoes, poultry, meats and fish. 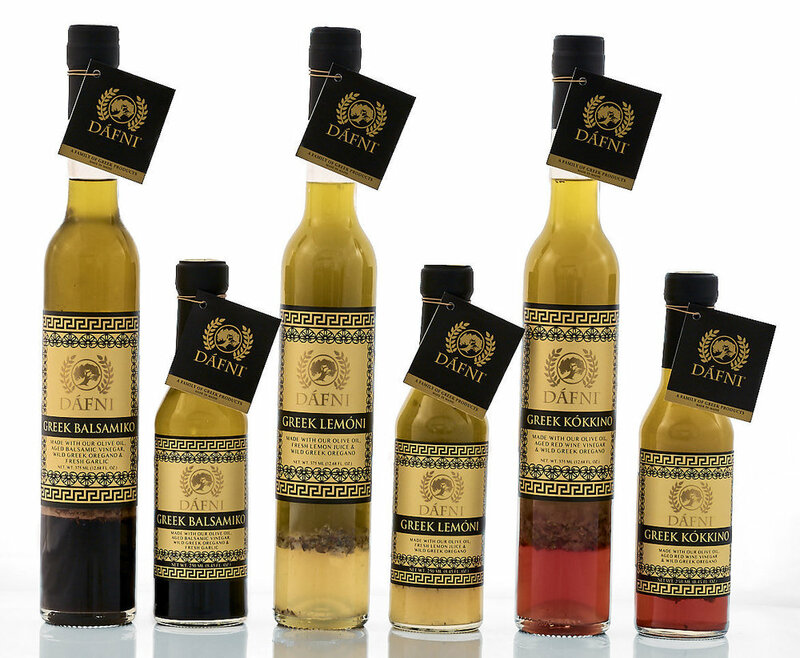 Get creative in your kitchen with the savory, delightful tastes of DÁFNI Greek Drizzling Oils. If you ask any chef what makes a meal, the answer is “It’s all about ingredients.” The finest flavors in life come from the highest quality ingredients and our Drizzling Oils are all made with only four top quality ingredients. The last key component is passion. Each bottle is handcrafted in small batches to ensure the highest level of quality and freshness. We use only 100% natural ingredients with no artificial additives or thickeners. Our balsamic is smooth and salt free, and our other two Drizzling Oils have very little salt yet are still incredibly rich in flavor. Our goal is to provide products that are always fresh, healthy and natural, with our traditional Greek family touch. Our passion comes through in all the products we create, with a central focus on quality. All of our Authentic Greek Drizzling Oils are made in small batches to ensure the highest quality and freshness. Our drizzling oils are available in 3 sizes and make great gifts! Ingredients: Dáfni Unfiltered Extra Virgin Olive Oil, Balsamic Vinegar (aged ten years from Modena, Italy), Fresh Garlic, and DÁFNI Wild Greek Oregano. SODIUM FREE. Drizzle over salads, steamed vegetables, steak, beef, grilled chicken, salmon steak, stir fry and fusion cuisine, mozzarella and tomatoes, and bruschetta. Fabulous for marinades and bread dipping. Use it to make garlic bread or for your tuna salad, chicken salad, pasta salad, and potato salad instead of a mayo base! Ingredients: DÁFNI Unfiltered Extra Virgin Olive Oil, Lemon Juice, DÁFNI Wild Greek Oregano, Pacific Sea Salt. Ingredients: DÁFNI Unfiltered Extra Virgin Olive Oil, Aged Red Wine Vinegar (from Modena, Italy), DÁFNI Wild Greek Oregano, Pacific Sea Salt. Great on salads, steamed vegetables, oven roasted potatoes, poultry, pork, scallops, white fish, pasta, rice, sandwiches, and bread dipping. Delicious to use for cabbage salad/cole slaw, potato salad, and pasta salad instead of a mayo base. Our Drizzling Oils should NOT be refrigerated after opening; just store in a cool, dark place to preserve their flavors. Best to use within six months of opening for peak freshness, and shake well before each use.